Oakwell Farms is a Texas family affair with, (from the left, standing) Frankie, Whitney and Frank Owens. 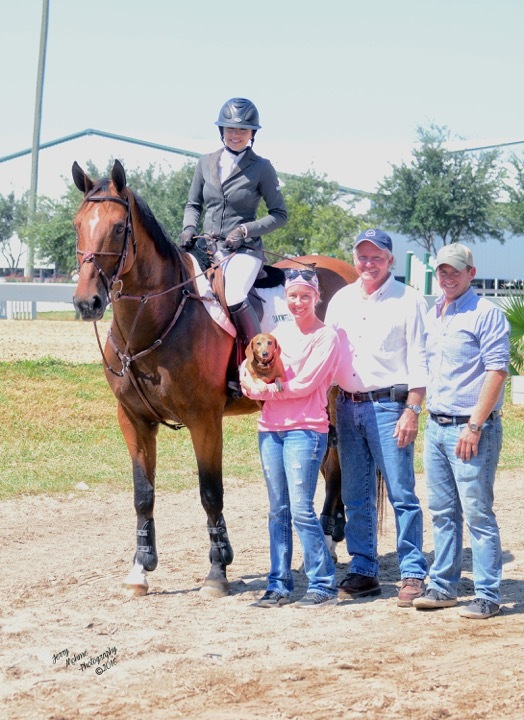 It should come as no surprise that Oakwell Farms, a hunter/jumper facility in San Antonio, Texas, is a family affair. Patriarch Frank Owens was a top pony competitor and his late wife, Candie, also excelled in the show world. 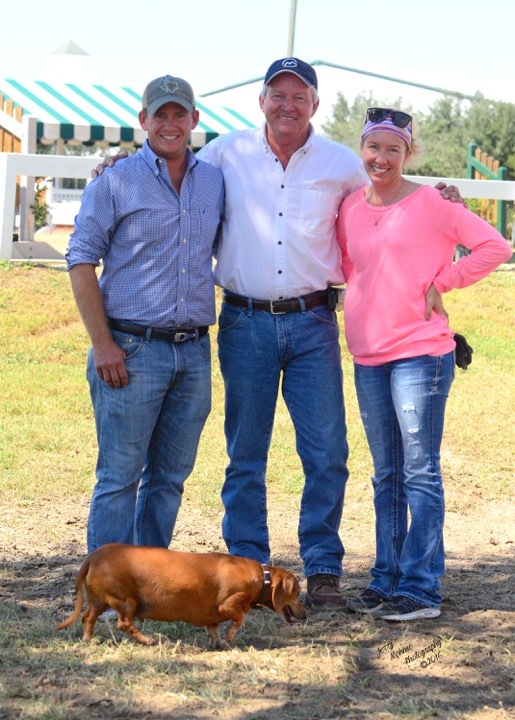 Their children, Whitney, 34, and Frankie, 32, grew up in the business collecting their own accolades as junior riders before joining the professional ranks and becoming an integral part of the Oakwell Farms lesson and training program. Frank and Candie fit the textbook “childhood-equestrians-turned-professional-riders-and-trainers, get-the-kids-involved-in-the-family-business” scenario. But it didn’t always look like it’d be that way: When a war half a world away threatened the way of life most people knew, it was in fact the event that cemented the couple’s future in the horse industry. Frank shows off his skills that began as a child in the pony ring. Ponies defined Frank Owens’ childhood. His mother, Christine Owens of Retreat Farm in Gordonsville, Virginia, bred Welsh-Thoroughbred cross ponies for more than 45 years. Her first great pony was the mare Fancy, whom Frank would later ride. Of the many champion in-hand and performance ponies Christine bred, her most famous was the crossbred stallion Welsh Hills, who was among the USEF’s top 10 sires of pony hunters in 2004. She also bred Southern Lad, the sire of many ponies showing today. 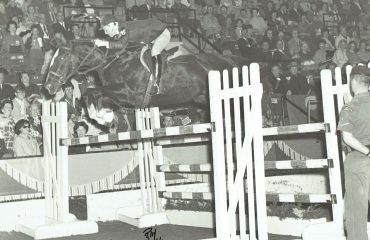 Naturally, Frank learned to ride and competed in prestigious shows in Canada and along the East Coast, earning top placings in many events aboard his mother’s well-bred ponies. “If the show was held Saturday and Sunday, that was considered a big show,” he said. As a junior rider, he qualified for two International Pony Team Competitions, the forerunner to today’s U.S. Pony Finals. 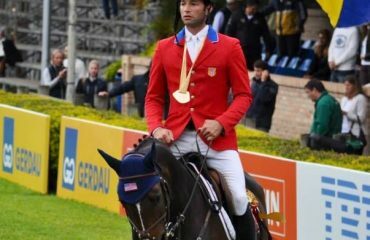 Selected as one of eight riders, Frank represented the United States on Fancy. The team competed in Canada and England, tying for the reserve grand championship at Windsor in 1961. “For us kids, it felt like we were competing at the Olympics,” he said. Despite a childhood filled with horses and trophies, becoming a professional trainer and exhibitor wasn’t always his plan. After high school, he enrolled at Virginia Weslyan College where he earned a bachelor’s degree in biology. His plan was to continue his education in veterinary medicine. The United States Army changed that. Frank was drafted in 1970. Instead of being sent overseas to the rice paddies of Vietnam, his orders sent him to Fort Sam Houston in San Antonio, Texas. There he served under the command of Col. John Russell, a highly decorated veteran who received the Soldier’s Medal and the Purple Heart among other top honors. Soldiers assigned to Col. Russell trained pentathlon athletes for the 1972 Olympics in Munich, Germany. The pentathlon requires athletes to compete in five events: shooting, swimming, fencing, show jumping and cross country running. At that time, the pentathlon team was funded and trained by the United States government. “I owe my life to horses. I was so very fortunate that the three years I served were here in the United States,” Frank said. Serving at Fort Sam Houston not only determined Frank’s career path, it introduced him to Candie, his future wife. “We had 100 horses under our care and young women from the local area would come and help us work the horses,” Frank said. Candie had been riding since age 10 and was an accomplished rider in her own right. She trained and showed young horses until she retired from showing and then focused on coaching and training clients. The Owens Family: from the left, Frankie, Whitney, Candie, who passed away in 2014, and Frank. 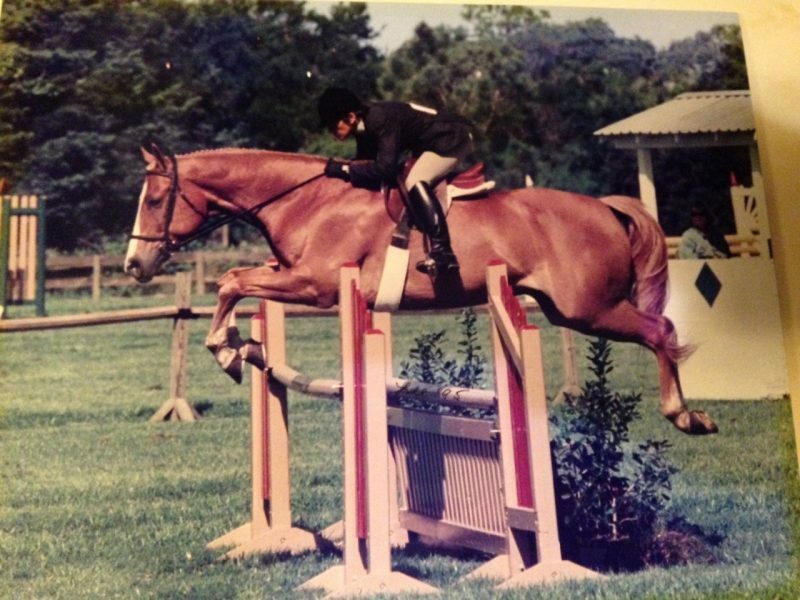 Frank and Candie married in 1975 and moved to Virginia to begin careers as professional trainers. In 1984, Candie’s mother became gravely ill, so the young couple and their two children packed up and moved back to San Antonio. They were first hired as head trainers at an established facility. Two years later, they left to establish their own business, Oakwell Farms. 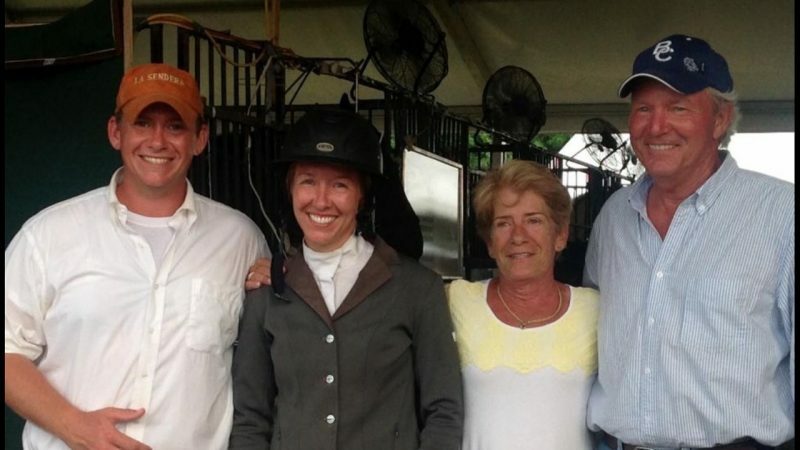 The husband/wife team shared their expertise with clients of all ages, helping them accomplish their riding goals at all levels of the discipline. Their daughter, Whitney, had an early interest in horses. She began riding and showing ponies at 6 years old. 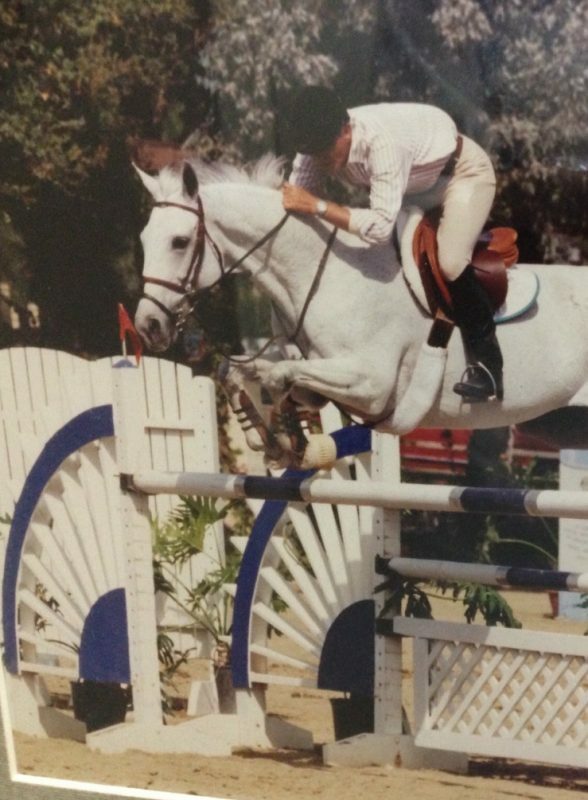 She showed as a junior in hunters, jumpers and equitation, and participated in the Young Rider program. “It was a great experience, and it taught you how to be a part of a team,” she said. When Whitney first started riding, she was terrified of cantering. She found the courage to canter at the Gillespie County Race Track, a facility that hosted shows as well as races. “We looked out at the track and there she was, cantering her pony down the track. We were patient and never pushed her to do more than she was comfortable doing,” Frank said. Today, Whitney is an accomplished professional with top placings, and also started showing in the Grand Prix since turning professional in 2000. 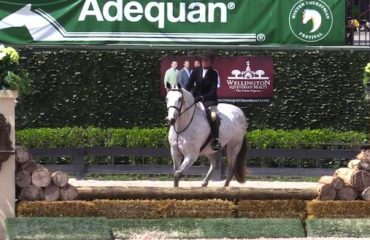 Though there was never any question about Whitney’s interest in riding, Frankie didn’t immediately take to horses. “He was more interested in playing in the dirt with his trucks,” Frank said. As they patiently waited for Whitney to find the courage to canter, Frank and Candie were equally patient in waiting for Frankie to show an interest in riding. It wasn’t until he was 14 that riding and showing appealed to him. “He had a little later start but he’s made up for lost time in becoming an accomplished horseman,” Frank said. The door was always open to Whitney and Frankie as it related to joining the business, but the decision was theirs to make. “We didn’t force either of our kids to join us in the business. We left it up to them and it’s worked out really well,” Frank said. Frankie excels with the young horses. A mare named Peggy Sue was one of his favorite projects that he trained and brought along from her first horse show to her first Grand Prix win. “It’s very rewarding starting a horse under saddle and progressing with it up to the Grand Prix level,” he said. While Whitney said she couldn’t pick a favorite horse, she admits the stallion S & L Shoe Guru, a 15-year-old Anglo European, is a special horse to ride. She and the horse, owned by DS Holdings LLC, clicked immediately. Among other top finishes, Whitney and Guru finished second in the Pin Oak Week II $25,000 Superior Energy Grand Prix in 2015 and second in the $25,000 Bohicket Marina Grand Prix, which wrapped up the Charleston Summer Classic in July 2014. Oakwell Farms continues to focus on family and welcomes riders from as young as 6 through adulthood. Located within the northeast city limits of San Antonio, the 48-stall facility is located on a back road that offers the feelings of a country setting while providing easy access to clients in the area. Candie excelled in the show world and during her life she made many contributions to the equestrian world including helping to create the Pre-Green Incentive Program. Whitney and Frankie have taken the reins as Frank has retired from competing, but he continues to train at home and travel to the shows. In 2014, Candie passed away after a brief illness. She was a horsewoman who loved the sport and exhibited a selfless dedication to the industry, in front of and behind the scenes. “Candie is not only missed as a mother and wife, but a big part of the business. Her many friends still talk about her and I know her legacy will be carried on by Whitney and Frankie,” Frank said. After Candie’s passing in 2014, Oakewell Farms and DS Holdings, LLC established a $5,000 High Score American-Bred in her honor. The bonus award is presented annually during the Opening Ceremonies of the USHJA Pre-Green Incentive Championship Round. Candie helped start the Pre-Green Incentive Program and the creation of this bonus award in her remembrance honors the contributions she made to the industry.